And I thought, here’s a great example where you could use jQuery and SharePoint in the wild. With jQuery you could easily hide the “Upload Multiple Files…” link… well.. I assumed you could.. I mean how hard could it be? Keep in mind that ANYTHING you see on the page that is not Flash, Silverlight, or an Active X control can be manipulated with jQuery. There’s probably a couple of other things that can’t be modified, but I don’t know what they are off the top of my head… generally, it can be manipulated. We can tell a couple of important things from this page. First thing we want to do is figure out how to delete the link. 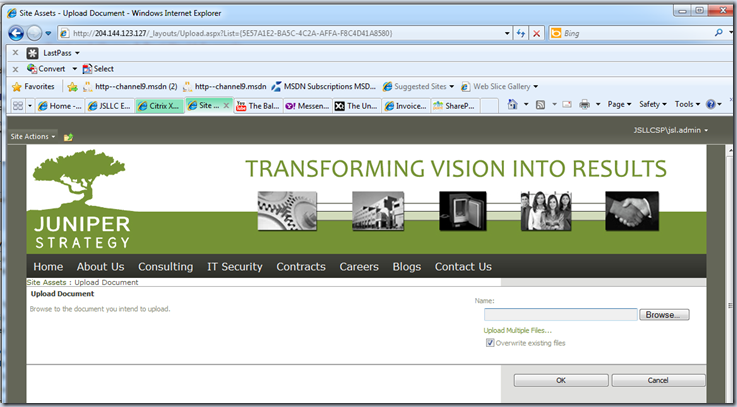 From looking at our DOM we see that the link has an id of “ctl00_PlaceHolderMain_ctl01_ctl05_UploadMultipleLink”. Hmmm… that’s actually not too messy of an ID. Could it be that it’s consistent? As far as I know it is consistent for SharePoint 2010. I’ve not looked at it in other versions, so I don’t know if it’s always going to be that ID. Regardless, that’s what we are using for this demo. We also know from the second blog post in this series how to get that element to manipulate it. //function that takes the GUID as a parameter. // the code that is executed after the page loads. There we go, our script is complete. Now we just need to save our script file to our document library and figure out how to add the script so it can be executed. Now as part of your MasterPage loading it will hide the “Upload Multiple Files…” link for a specific document library on the Upload.aspx page. Go ahead, give it a try… Not too hairy is it? So, why use jQuery in this instance? So, you might be thinking “Why not just edit the page in something like SharePoint Designer and delete the link off the page or something? Well… even if that was an option I probably would not suggest it and in this instance it’s NOT an option. The page that has the ”Upload Multiple Files…” link is on the Upload.aspx page.. to be more specific it’s on the /_layouts/Upload.aspx">/_layouts/Upload.aspx">http://<site>/_layouts/Upload.aspx page. This is a page that resides on your file system in the _layouts directory. So, if you are using Hosted SharePoint 2010 or Office 365 you CAN’T modify this file at all (as far as I know). And even if you DO have access to the file system it’s generally bad practice to modify these files and you have no guarantee that some patch won’t overwrite your changes. So, editing the page itself is out of the question. What would Eric Shupps do in this situation? That’s what I ask myself when I’m either writing code or at a bar and generally the answer is either “more code” or “more Corona”. Seriously though, what are the other options here? You have a page in your Layouts directory that you want to modify? I bet Eric would tilt his cowboy hat every so slightly and reach into his back pocket and pull out a custom HTTP handler. Wouldn’t that be slick? With a custom HTTP handler you could redirect the user to your own custom Upload page if they try to go to Upload.aspx. This opens up a world of possibilities for how to handle many situations. However, unless you happen to have a custom HTTP handler written already, it’s not a trivial task to implement one. Also, if you are using Hosted SharePoint 2010 or Office 365 I imagine you can’t deploy a custom HTTP handler as a sandbox solution (I’m sure someone will correct me if I’m wrong). The solution I’m proposing here will work on SharePoint 2007, 2010, Hosted SharePoint 2010, and Office 365… heck, I’m sure it would even work on SharePoint 2003 but does anyone really use that anymore? Let’s face it. Time is important. Sometimes more important than money. When I saw Christina’s post I had no idea exactly how to do what she asked, I just knew it could be done. From the time I saw her post until the time I emailed her working code took less than half an hour, and I’m pretty sure that involved one bathroom break and a couple of other emails. So, even though this solution works well it’s not perfect. It has a couple of shortcomings that really make it less than ideal. The fact that the script is referenced in the MasterPage is not great because this means that the script gets executed on EVERY page, not just the upload.aspx page. That’s BAD mojo and makes me cringe to think about it. You could somewhat alleviate this problem by checking which page you are on before you execute the script and if it’s not Upload.aspx then don’t execute the rest of the script, but you have to execute script to check which page you are on. See why I don’t love this? Also, you actually “see” the “Upload Multiple Files…” link for a split second before the jQuery executes to hide the link. You do have other options here if you want to make the effort (I’m too lazy). You could do something like not hide the link, but instead make it pop up an alert that says “This document library does not allow multiple documents to be uploaded” or something like that. Then the user doesn’t see the link change, just the behavior when they click on it. Plus, if you make something idiot proof they will make a better idiot. You WILL get some user who calls complaining “There’s no link to upload multiple documents!! !” Ah users… if it wasn’t for users every deployment would be a success. Anyway, there you have it. One of the many practical uses of jQuery. Have a better solution? There’s a comments section for a reason people!! When I need to style a page, my first thought is to use CSS. So much lighter! Thanks for keeping me in line!